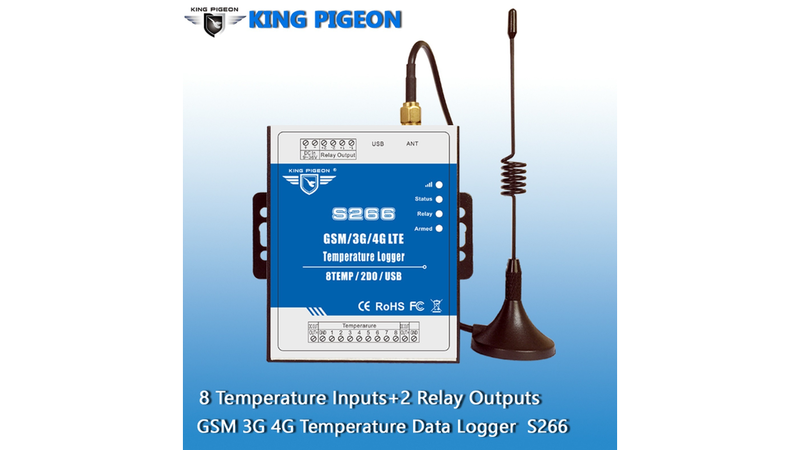 King Pigeon GSM/3G/4G LTE S266 Data Loggers are special for remote monitoring the onsite temperature.Not only for monitoring Temperature in real-time, also support high/low .SMS/Call alert to max 10 user phone numbers. The Data Logger with large memory that can save 200000 events. Moreover,It provides 2 Relay outputs for automatically switch ON/OFF devices when Temperature exceed high/low value and remote switch ON/OFF Device by SMS or GPRS/3G/4G. It has been designed as a cost effective, low power, self contained data logger. It has 8 temperature sensor inputs with embedded GSM/GPRS/3G/4G module to provide an all in one instrument for data logging, Remote data acquisition, alarm and control. Ø Billboard, Ads Signs LED, etc.